The UAE’s Minister of State for Tolerance, Sheikha Lubna Al Qasimi, and around 30 Christian leaders from the Gulf, yesterday visited the site of the early Christian monastery on Abu Dhabi’s western island of Sir Bani Yas. The visit was the first part of a day of discussions on ways in which Christian communities in the Emirates can contribute to the promotion of the UAE government’s Tolerance Agenda. On arrival at the site of the monastery, they were briefed by archaeologists working for the Abu Dhabi Tourism and Culture Authority, TCA Abu Dhabi, which is responsible for investigations into and the preservation of the cultural heritage of the Emirate of Abu Dhabi. While at the site, the visitors performed an impromptu prayer. "This site is a symbol of the diversity we have in the UAE," Sheikha Lubna told the visitors. "Nations develop and flourish when they accept differences and work on their similarities." "The emphasis being placed on this site is evidence of the commitment of the UAE towards its archaeology and history, particularly for sites such as this which represent our values of tolerance, co-existence and peace," she added. 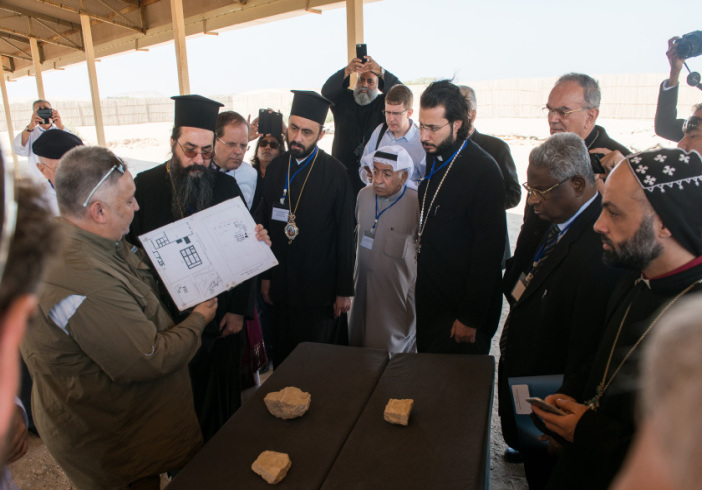 "We greatly appreciate the opportunity to visit this important site," Archbishop Nathaniel, Patriarchal-Vicar for the Arabian Gulf of the Syrian Patriarchate of Antioch and All the East of the Syrian Orthodox Church, commented. "Not only does it provide evidence of the presence of Christianity in the UAE just before and during the early years of Islam, but the way in which the leaders of the United Arab Emirates are devoting so much attention to its excavation and conservation is testimony to the way in which they, and the whole of the UAE, are devoted to the promotion of religious tolerance and freedom of worship today." Commenting on the significance of the visit, Mohamed Khalifa Al Mubarak, Chairman, Abu Dhabi Tourism and Culture Authority, TCA Abu Dhabi, said, "The archaeological sites on Sir Bani Yas Island which were part of the Church of the East, dated to the 7th and 8th century CE/AD, attest to the long history of religious tolerance in the UAE. The monastery and church are one of dozens of archaeological and heritage sites in this part of the country and this rich and unique history contribute to the cultural heritage of the coast and islands of Abu Dhabi. "The excavations at the monastery and church, undertaken by TCA Abu Dhabi archaeologists, form part of a major publication of all archaeological and heritage sites on Sir Bani Yas, and have provided an excellent opportunity to engage and train a younger generation of Emirati archaeologists. They will be at the forefront of future work at the site and in so doing will play a critical role in investigating their country's heritage." The site of the monastery was first identified in 1992 during a survey undertaken by the Abu Dhabi Islands Archaeological Survey, ADIAS, on the instructions of former UAE President, the late Sheikh Zayed bin Sultan Al Nahyan. Studies of the finds from the excavations as well as other research suggests that the Sir Bani Yas church and monastery may have been founded some time in the early to mid- 7th Century CE, at a time when, prior to the coming of Islam, Christianity was present throughout eastern Arabia. Although there is evidence in ancient documents of the historical presence of Christianity in the UAE, the Sir Bani Yas monastery is, so far, the first physical evidence to have been discovered. During the excavations at the Sir Bani Yas site, finds of particular importance were a number of plaster friezes that would formerly have decorated the church. Studies suggest that these date back to the mid-7th to 8th Century CE. The weathered surface of some of the pieces indicates they were used externally on the building although others were probably used inside the church. Some pieces have Christian crosses on them while others depict flowing scrolls connecting palm leaves and grapes. Decorations of this type are known to belong to the architectural style of the Church of the East, one of the Eastern group of churches. Founded in the 5th Century CE, the Church of the East spread throughout Iraq and Iran, down through the Arabian Gulf and away to India. It also expanded throughout Central Asia as far as western China before beginning to decline in the 14th Century CE. Three successor churches survive today, although much reduced in numbers, the Assyrian Church of the East, the Chaldean Catholic Church and the Ancient Church of the East. They all use the Syriac language in their services. 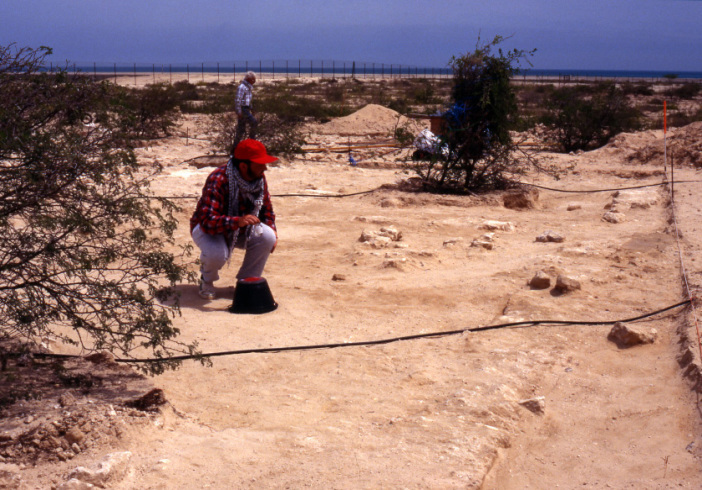 The particular significance of the Sir Bani Yas site, and the plaster objects uncovered during the excavations, stems from their date and context, which roughly coincides with the beginning of Islam’s spread into southeastern Arabia. The discovery of the church and monastery, along with its series of associated courtyard houses and other buildings, is evidence that a significant Christian community was living on Sir Bani Yas at this time, living side by side with the country’s Muslim inhabitants. This reflects a prevailing spirit of religious tolerance and the peaceful coexistence of diverse religious communities. The excavations at the site have shown that it was eventually abandoned, with the buildings eventually collapsing. Following the initial discovery, the late Sheikh Zayed personally encouraged the continued archaeological excavation and preservation of this internationally important site. Today, it is a central focus of plans by the Abu Dhabi Tourism and Culture Authority to promote Sir Bani Yas not only as a key element in the UAE’s cultural heritage but also as a tourist destination. Other sites for tourists are also being developed on the island. Sir Bani Yas, which has recently opened a dedicated terminal for cruise ships, is also home to a large collection of endangered species of animals, originally established by Sheikh Zayed, with special safari-type excursions for tourists through the island’s wildlife park.